When it comes to selecting a pair of hockey skates there is no “best hockey skate” it all comes down to what the best skate for YOU is. 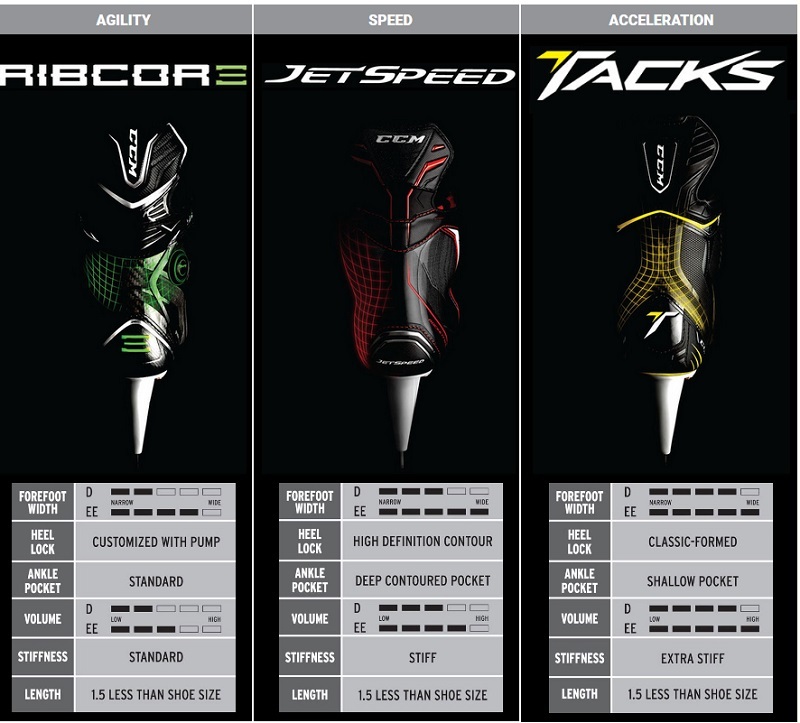 The best skate depends on your skill level, playing style, foot size width and depth, ability and weight. 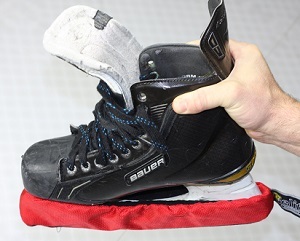 In a previous article we covered fitting hockey skates (make sure you read that article as well). In this article we are going to go into detail on how you can determine which skate will be best suited depending on your personal preferences and playing ability. How much should I spend on a pair of Hockey Skates? If you just want to learn to skate at the moment, but your goal is to begin playing hockey I still recommend getting the more expensive skates (that way you don’t have to buy new skates down the road). Some stores will have sales on last years models, this is a great way to get the higher end skates for a good price. If you find this opportunity (and the skates fit you properly) then take advantage of it. When you are at the store, make sure you get a good fitting for your hockey skates: In this article we will cover personal preferences in skates, and which style and brand of skate will be best for you. Can the Steel be Replaced on Your Skates? Ask about replacing steel (the skate blade). 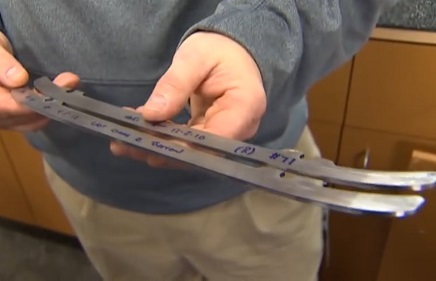 Most skates that are designed for hockey will have replaceable steel. Some brands like CCM have visible screws on the outside, and other brands like Bauer have the screws underneath the heel beneath the sole. Skates without replaceable steel are most likely low-end skates, not meant for regular use. Good skates are designed to outlast their blades (and blades can sometimes break) so you need a skate that allows you to replace the steel when needed. Without this option you will need to replace your entire skate within a few years. When will you replace the skate blades? 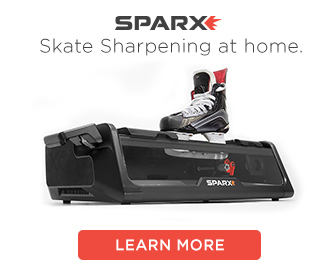 This varies, but if you play more than once a week and get your skates sharpened regularly then you will need to replace your skate blades after a few years. After being sharpened over and over the steel wears down, and once it gets too close to the plastic it can effect your skating. The guys at your pro shop who sharpen your skates will tell you when it’s time to replace the steel. It’s not expensive to do so, and means you get to keep skating in the skates that you love! Some pro players replace their steel every few weeks, but these guys sharpen their skates before every game, and are on the ice almost every day, and sometimes twice a day. 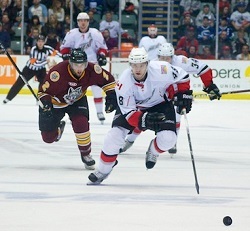 Some players are more aggressive, they are always on their toes ready to go and pounce on the puck. Other players are more reserved, they play a defensive game, they like to read plays, play heads up hockey and stay on the defensive side of the puck. Some skates will help put your in a more aggressive stance. These skates are designed with a forward pitch at the ankles that allows you to get a deeper knee bend. 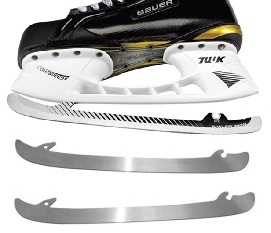 Some skates also have a pitch in the blade holder that will put the player more on their toes. Alternatively you can also buy skates with a more traditional fit, these skates are better for the reserved players and should be selected depending on your style of play. What fit do you prefer? Different skate brands will provide different fits for your feet. In our skate fitting guide we cover the different sizes and widths which will help you pick the right size of skates, but after you know your size you can still determine the feel you prefer. Some skaters prefer a snug fit, while others like a looser fit. The right fit depends on the shape of your foot as well as your personal preference. 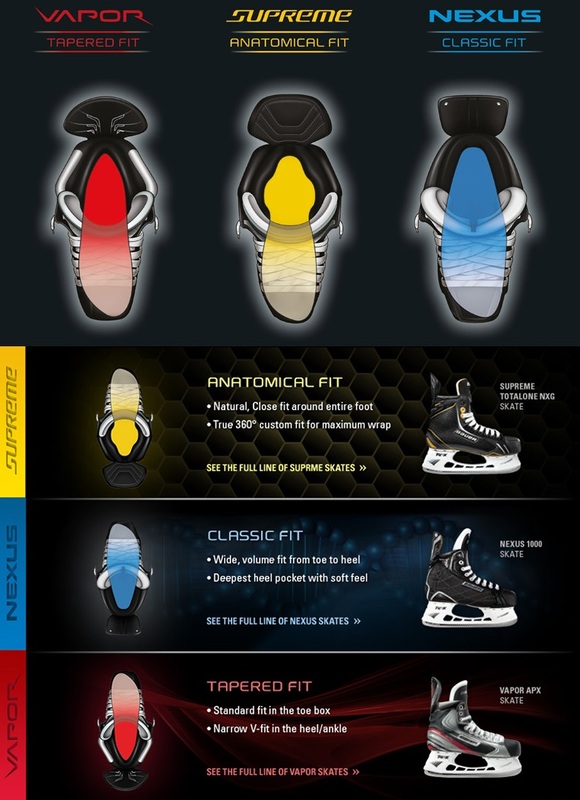 Below we have a chart that covers the different fit that each line of skates provides. How Stiff should my skates be? To determine how stiff the skates are you can perform the squeeze test. Hold the skates by the quarter package (the back / heel of the skate) with the toe facing away from you. Grip the skate in one hand near the top but below the tendon guard (that piece that flares up to protect your tendon). Now squeeze the skates and try to bend the sides inward. If the skates fold together with only a little resistance (kind of like a good pair of boots) they aren’t strong enough for hockey. If they are hard to squeeze together they are solid skates and are stiff enough for hockey. If you are performing crossovers, tight turns, quick starts and hard stops you want good ankle support, which usually means a stiffer boot. Some players prefer more mobility, and some high end skates offer less stiffness for more mobility. If you are just starting hockey, you probably don’t require the stiffest boot on the market, as it could restrict your from developing good ankle support, and you may not stress the skates enough to properly break them in. A boot that is too stiff for your playing ability could reduce your ability to get a good knee bend. Newer players are typically advised against using a very stiff boot. Remember when buying hockey skates you need to factor in your foot size, width, arch, playing style, playing ability, and weight. What Skates are best for New Hockey Players? 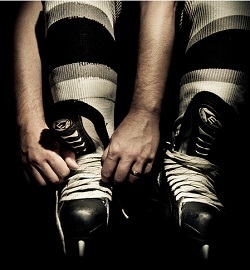 For a new hockey player a middle of the line skate should be perfect. If you go for a top of the line skate it could be too stiff for your playing style, and if you go for a low-end skate it could end up not giving you enough support (making your ankles bend), hurt you feet, and end up falling apart quickly. Look into skates in the $150-$300 price range. If you have a good local hockey shop nearby drop in and try to find a pair of skates that fit you. If you live in an area where hockey isn’t very popular or you know which size and skate you want, you can try looking online. 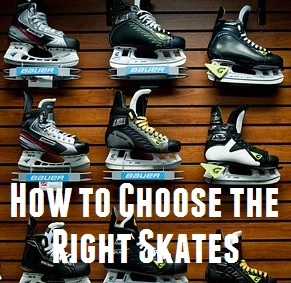 Be sure to read our hockey skate fitting guide before buying skates. Expensive does not always mean better. As we have outlined above you need to find the right type of skate to fit your experience and playing style. Average priced skates ($150-$400) are made for recreational hockey. Some will not hold up so well, and others will hold up fine, it depends on the brand and model. An average priced skate should be fine for most players. High end skates ($400-$800) are made for competitive hockey and skilled skaters. They are usually stiffer, lighter, and have all the bells and whistles. If you skate a lot and skate hard, you should be shopping for higher end skates. If you are shopping for skates for kids I do not recommend the most expensive skates as the kids will grow out of them very soon. Look for used skates, or a decent pair on sale. Check their clearance and discount sections to find good deals! Also when buying online make sure you know the return policy so you can return the skates if they do not fit properly. When possible it’s recommended you buy your skates in stores (from an employee who knows what they’re doing), especially if you are new to hockey. 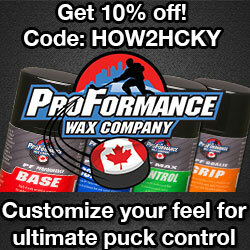 For some people it’s not easy to find a good hockey shop and get properly fitted, and that’s why this website exists. If you’re buying online I recommend the below stores, most have a return policy that will allow you to return your skates if they did not fit properly (and haven’t been used). Keep in mind most high end skates will feel tighter or more stiff right out of the box and will need to be baked. Baking the skates will form them to your feet and can be done at a local hockey shop or at home when done properly. Is the Bauer Supreme slightly narrow or slightly wide in the toe box? They are not noted the same in two of your articles. Thank you. First off, I have very wide and flat feet. Currently, I use CCM 06 hockey skates in size 5EE. I’m thinking about buying a pair of Easton mako skates online size 5EE. Would they be the same fit overall for my wide feet?